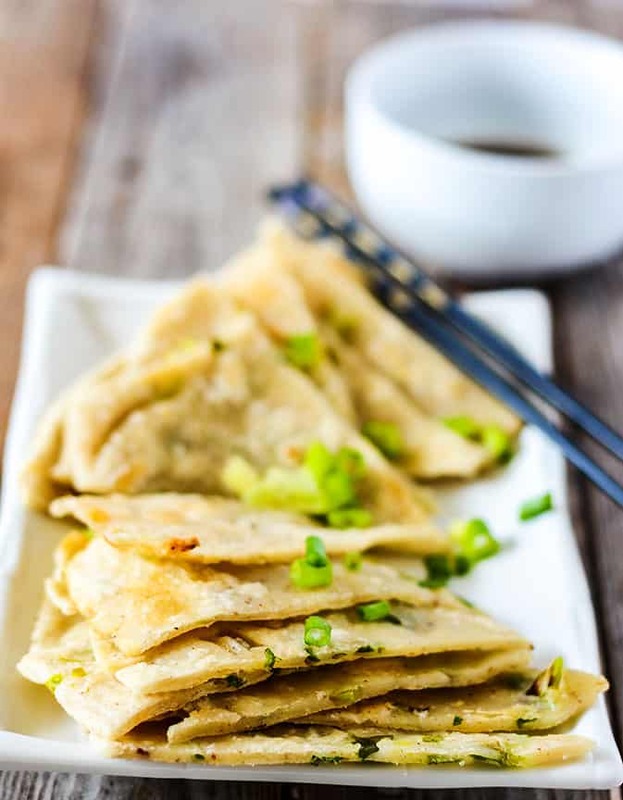 These amazing Chinese Scallion Pancakes are so crispy and tasty! 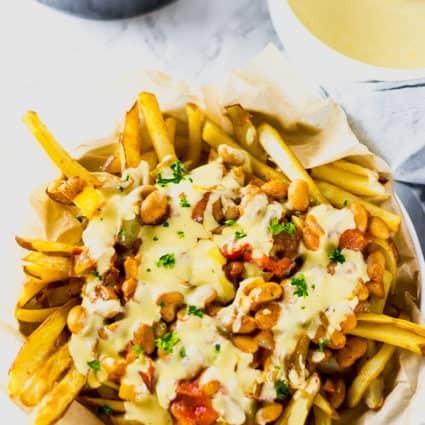 They are delicious served with my simple dipping sauce and they are Gluten-Free and Vegan! 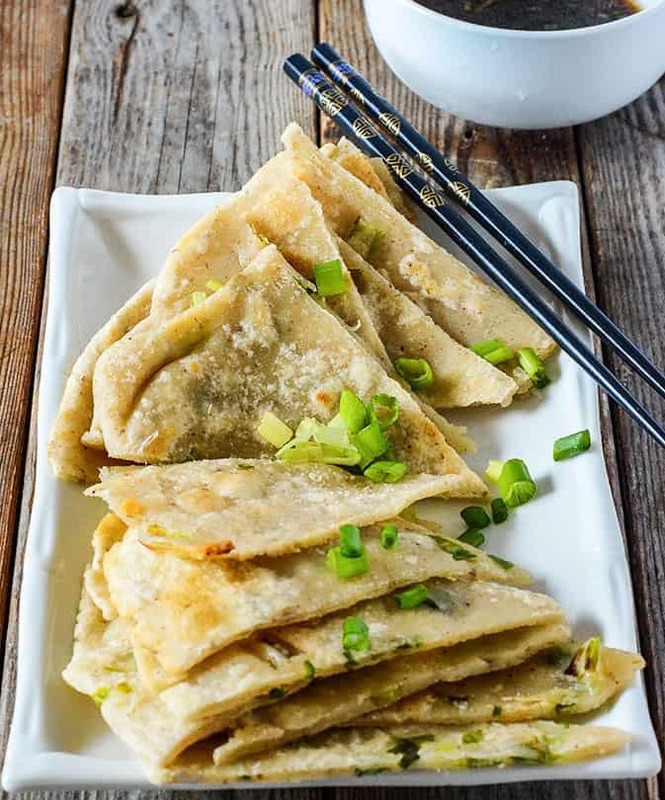 These Chinese Scallion Pancakes reminds me of our salt fish fritters that I ate while growing up in Jamaica, they are slightly salty and studded with scallions (green onions). We ate them for breakfast and they were very popular back home. I'm so excited that I can continue to enjoy the taste of home without the addition of salt fish. 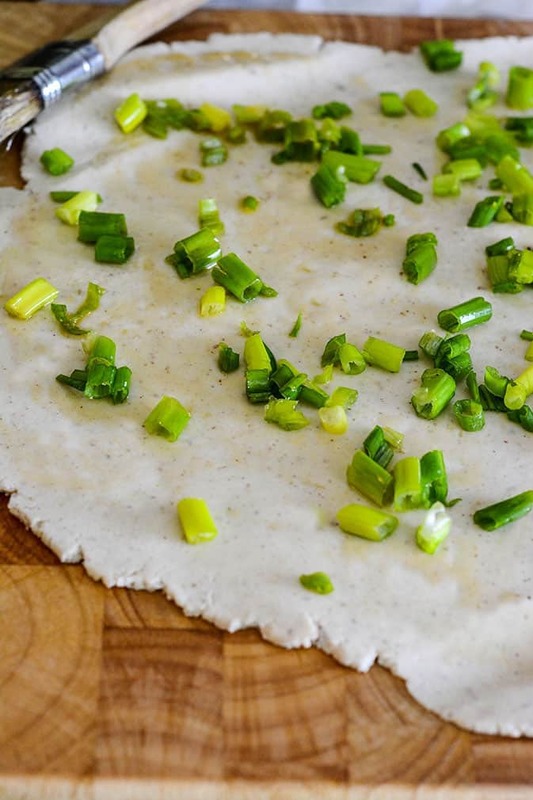 Chinese Scallion Pancakes are savory flatbreads folded with oil and scallions, unlike pancakes here in the USA they are made from a dough instead of a batter. They are served at Chinese restaurants or found in frozen sections of Asian markets. 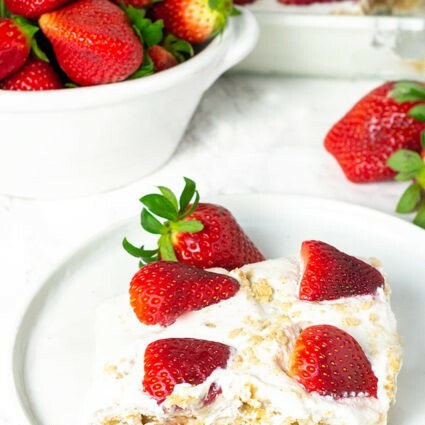 I was inspired to prepare my recipe after seeing THIS RECIPE, I used Bob's Red Mill Gluten Free 1-to-1 Baking Flour to make the dough which came together pretty easily. 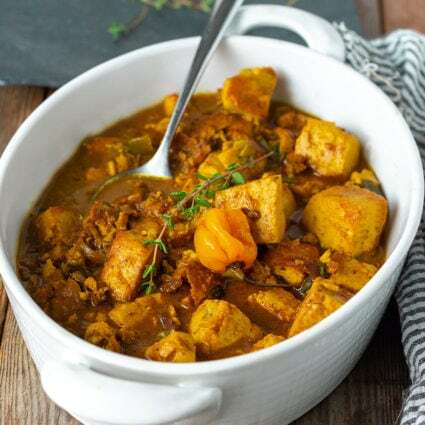 You will find that you don't need to knead the dough a lot because it is gluten-free and the dough doesn't need to develop as with regular flour. Gluten is what causes the dough to be elastic, so the more it's kneaded the tighter and more elastic it becomes. Because gluten-free flour doesn't contain gluten, it doesn't need to be worked and kneaded as much. You just form dough into a smooth ball and you are ready to roll it out.I added a little ground flaxseed, you can substitute with chia seeds. 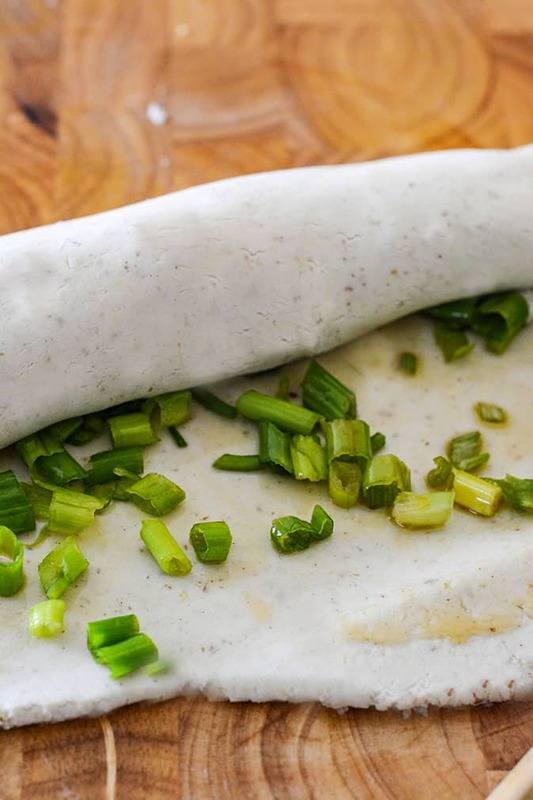 The dough is quite simple, but the addition of scallions/green onions adds amazing flavor. I divided the dough into 4 equal balls, then rolled each dough out very thinly, brushed with roasted sesame oil and chopped scallions sprinkled over it. Here I am rolling the dough like you would when making a jelly roll, then I roll dough into a spiral tucking the end in. 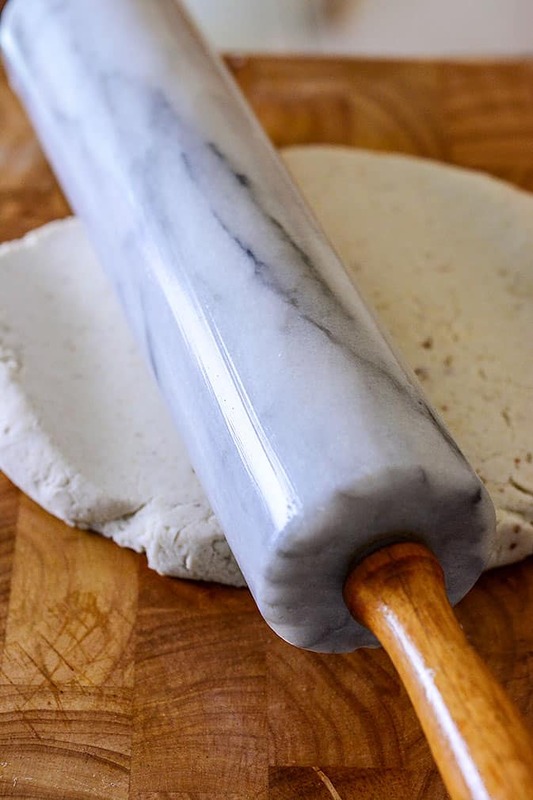 The dough is then rolled into a thin circle with a rolling pin. Here I'm rolling the dough into a spiral tucking the end in. The pancakes are then cooked on both sides in an oiled covered skillet. These Chinese Scallion Pancakes were amazing, they were crispy and chewy at the same time. Full of bold flavors, such a delicious treat. I made 2 batches and they were all gone! Place gluten-free flour, flaxseed and salt in a large bowl. Add water and mix until the dough comes together. 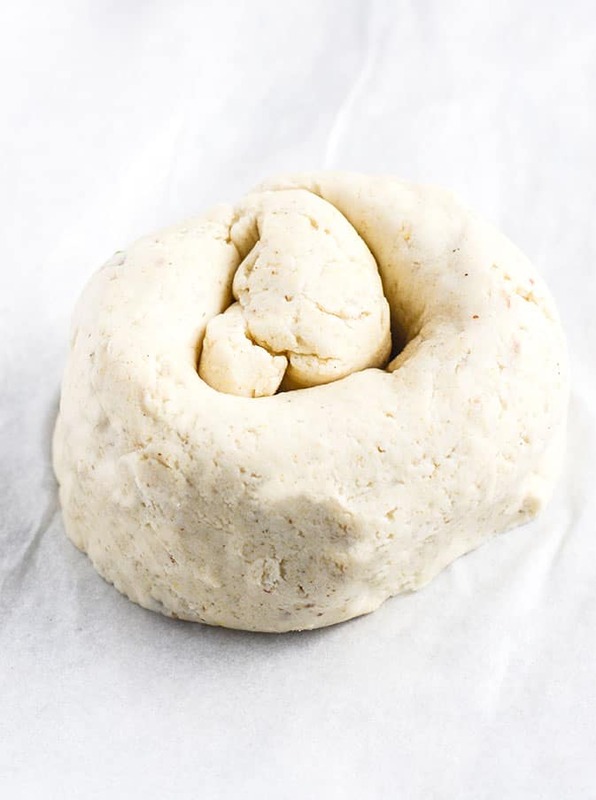 Using hand, form into a dough ball. Divide into 4 equal balls, roll each dough into a circle in between oiled parchment paper or clingfilm. Brush with sesame oil and sprinkle with scallion/spring onion. Roll dough into a cylinder, then into a spiral tucking the end in. Roll out into a thin circle. Heat oil in a skillet on medium high, gently add pancakes, cover skillet and cook for 2 minutes, turn over, sprinkle with a little salt and cook for another 2 minutes on the other side. Repeat for the other 3 pancakes. Cut into wedges. Delicious served with dipping sauce. Mix ingredients for dipping sauce into a small bowl and serve. Thank you for this recipe. 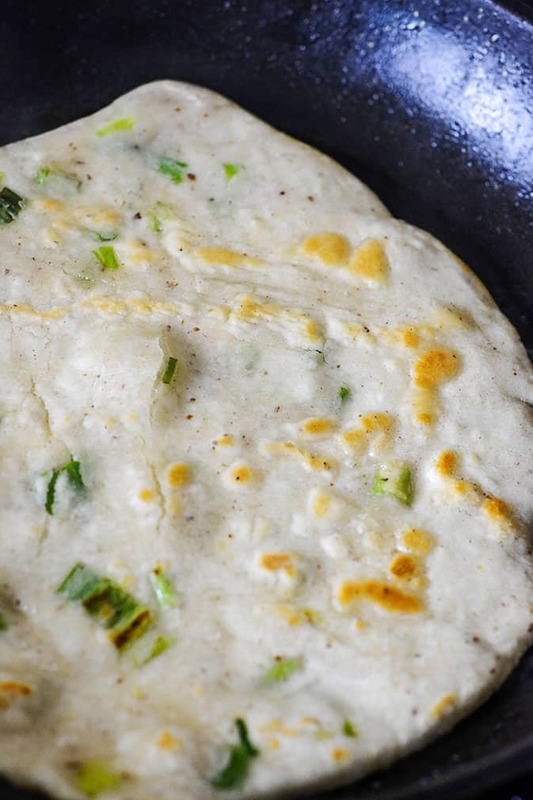 My Chinese husband and I haven’t had scallion pancakes since going gf several years ago. I showed him the IG post and he’s very excited-me too! Gail I hope you both enjoy them. Thank you.